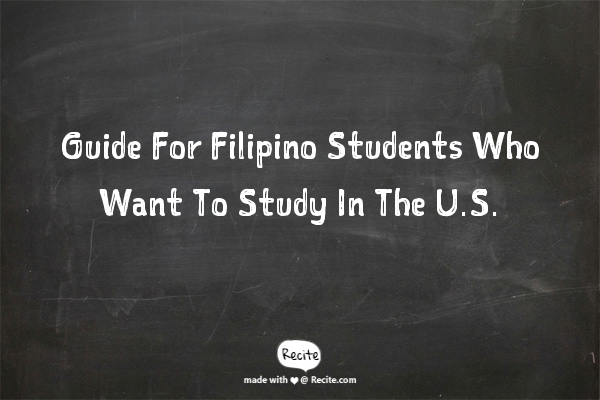 Are you a Filipino student residing in the Philippines? Are you interested in pursuing higher education abroad? Do you have any questions on how you can study in the United States? If you don't know where to start, this simple guide should be able to help you out. Where To Get Information About Studying In The U.S. The official source of information and resources for those interested in studying in the U.S. is EducationUSA. It's highly recommended that you visit the official website for EducationUSA and read all the guides and articles there. Your next step would be to contact the U.S. Embassy and learn about the process through the local office of EducationUSA (Facebook page; email: educationusa.philippines@gmail.com). You can message them on their Facebook page or contact them through the email address provided. For an in-depth understanding of the process, it's advisable that you attend the monthly group advising sessions conducted by EducationUSA. Below is an overview of the three advising centers in the country. All of these are within the Manila area. Below are the three advising centers in the Philippines, all of which are within the Manila area. Joining the walk-in events done in these centers is free. If you come across individuals or groups who promise to take you to these advising sessions in exchange for a fee, report them immediately to the police. EducationUSA advises students to send an email to educationusa.philippines@gmail.com containing the date they plan on attending an advising event. If you want one-on-one advising, it's recommended that you personally go to the U.S. Embassy and inquire how you should go about it. First Tuesday of every month, 2:00 p.m. to 4:00 p.m.
*Advising sessions happen every month except on January, July, and September due to U.S. holidays. Las Friday of every month, 2:00 p.m. to 4:00 p.m.
1) Research your options. - This is where you decide which school or university you will attend. The school you apply to must be certified by the Student and Exchange Visitor Program. 2) Finance your studies. - You can finance your own studies or you can seek for scholarships that may partially or fully pay for your education. You can learn more about your scholarship opportunities by attending any of the monthly advising sessions done in Manila. Or you can directly inquire at the U.S. Embassy. 3) Complete your application. - The application process depends on what type of education you will be pursuing in the U.S. (undergraduate, graduate, PhD). Make sure that you have all the necessary documents like transcript of records from the school you last attended. 4) Apply for your student visa. - The information you need to apply for a visa can be found at the website for the U.S. Department of State - Bureau of Consular Affairs. In the website, you will learn about the process in applying for a visa, the fees that you must pay, the documents you need to present, and the policies in the instance that you have children or a spouse that you want to reside with you while you pursue your studies in the country. 5) Prepare for your departure. - This involves making your travel arrangements, contacting your new school before you arrive, and attending a pre-departure orientation conducted by EducationUSA advising centers.